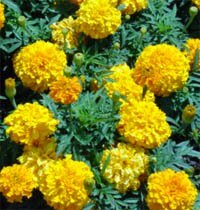 A Pha Khuan is a central handmade marigold pyramid which is a key centerpiece at every Baci ceremony. It is usually prepared and set up by elderly women in the community though in cities it can be bought from markets. 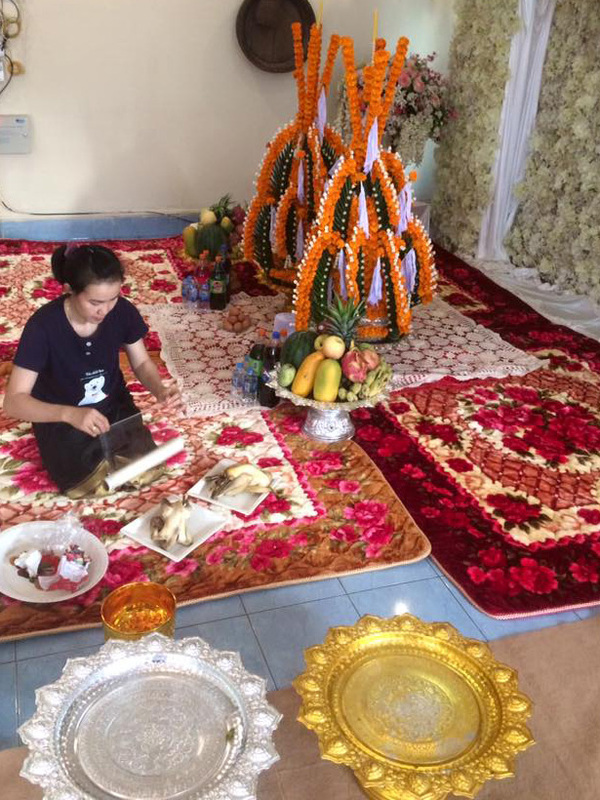 The preparation of the Pha Khuan usually takes place several hours or even a day prior to the ceremony. In the countryside, relatives and friends come to help preparing things that necessary for the ceremony as well as food to share at the end of the ceremony. The Pha Khuan consists of one elegant pyramid or castle looking arrangement of rolled and folded banana leaves which is called Maak Beng. A pen-sized candle is tied on a stick which is then stuck into the pointed top of the Maak Beng. The Maak Beng is then placed on a big round tray or bowl, often in silver. To make it stable, rice is put on the tray around the base of the Maak Beng. Baci ceremonies for different occasions use different size of Maak Beng. 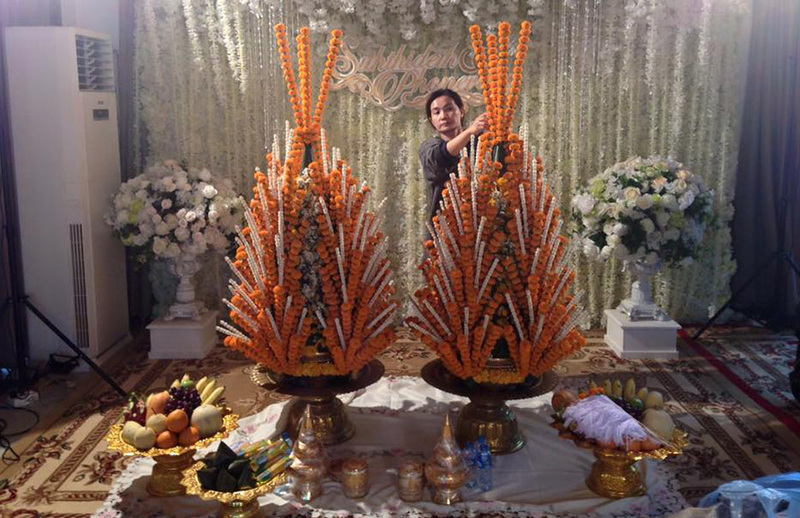 For weddings, usually two big 11-sprouted Maak Bengs are used, and 9 or 7-sprouted ones are used for Baci for other occasions such as Lao New Year and welcoming honored guests. White cotton strings cut around 10 inches in length or long enough to tie around the adult’s wrists. They are tied onto several sticks and the sticks are then stuck on the Maak Beng. Some long white threads are prepared and placed on the Maak Beng stretch across from one side to the other. These threads are to be held by Mor Phon (the master of ceremony) and the persons that the Baci is intended for. The Maak Beng is then decorated with yellow or white flowers. On the tray are cigarettes, boiled eggs, Khaotom, fruits, sweet, and boiled whole chicken with head, wings, feet and claws (tucked inside its stomach). The Maak Beng, the tray or the bowl and all other elements together make up a Pha Khuan. The finished Pha Khuan is placed on a white cloth at the center of the room ready for the ceremony.